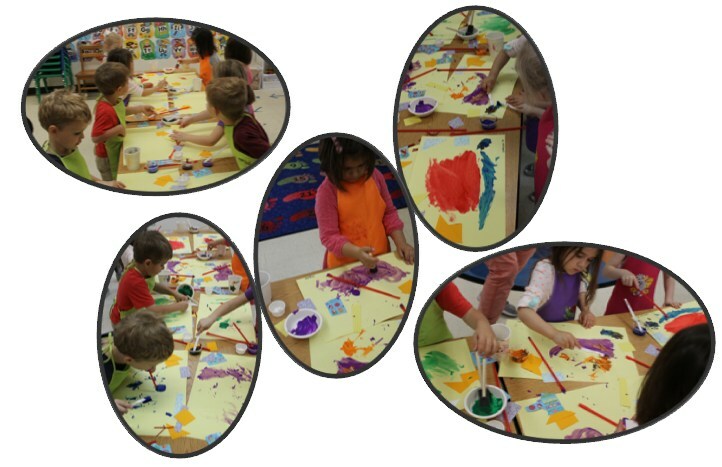 Our Preschool Plus students had the opportunity to freestyle paint using multiple mediums! They listened to fun music while exploring their creativity. Why teach Preschool Plus students about different art mediums? Freestyle art with use of multiple mediums, helps to broaden the spectrum of creativity for our young students. By incorporating different tools, the students can layer their ideas. How excited were students to participate in freestyle art? The Preschool Plus students were both curious and excited. They love to paint and so this project was even more stimulating as it had the added components of glue, stickers, toothbrushes, cut-out shapes, sponge-brushes and more. Can you provide us insight into the active learning process? The students were provided aprons to protect their clothes as they painted as a group. They used straws to blow paint globs around their sheet of paper. They used glue sticks to adhere their cut-out shapes to their paper. Students used toothbrushes to streak their paint strokes. They used sponge-brushes to dab or smear paint; some students even used their hands! How do the principles of this concept carry over in the students’ day to day interaction and/or prepare them for the next grade level? The participation in group freestyle art, encourages the students to explore their individual creativity while observing what others are doing. This kind of project helps the student discover their own abilities and preferences in their creative style. These tools are helping the student define their individualism through art. Are there any “take-aways” for you, the students, and or parents? The students really enjoyed themselves, some even bounce to the music in the background, others painted their hands and arms. They especially appreciated exploring the textures of the different medium tools. Talk about the different art mediums the students used; ask which one the student liked the most. Ask the student what did he/she like about another student’s art work. Our Kindergarten students have learned about the animal kingdom! The students delved into the different classifications of animals, identifying mammals, birds, fish, reptiles, and amphibians. Why teach Kindergarten students about animals? Animals are a part of everyday life, and the students are very curious to learn about other forms of life. This study expands the students’ knowledge of the natural world around them. They increase their vocabulary and learn to identify and articulate the differences between the animals. How excited were students to explore the animal kingdom? The students were eager to participate in the discovery lessons. Their hands would shoot into the air as they were bursting with excitement to ask and answer questions. They also enjoyed reading from the Science Studies Weekly Magazine’s life science articles. Students learned about the social structure of animal families, and a variety of animal subgroups in each category. The students were given the opportunity to share their experiences and knowledge of their daily interactions with their own pets, animals that they have visited at the zoo, and animals they have seen in passing such as owls, squirrels, and lizards etc. They also asked questions to understand why certain animals were cold-blooded and others warm-blooded; or why fish skin is called scales. At the end of the study, the students assembled a chart. The students performed this summary project together by placing the animal placards in the right category. The study of animal classification encouraged in-class discussions and helped strengthen the students’ deductive reasoning as they practiced classifying animals. Both of these skills will be needed in the first grade as they build on their public speaking skills and report organization. In kindergarten, they learn to put their thoughts in order to speak coherently, and in elementary school they apply this organization to informational and analytical writing. In addition, they deepen their understanding of the world around them. The study of animals nurtures students’ natural curiosity. It also provides an opportunity for them explore the world around them. They start with what they know and we stretch them to take the next step. The students thoroughly enjoyed discovering the similarities and difference between animal classifications. 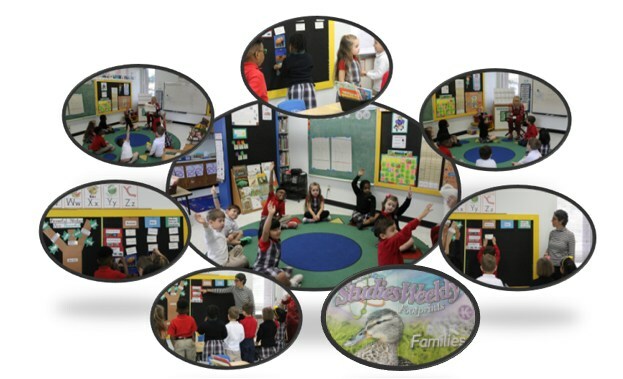 Through the weekly science articles and lessons, the students have learned the major characteristics that define mammals, birds, fish, reptiles, and amphibians. The students learned about family construct for animals which in some cases are very much like humans, that animal parents provide food and shelter for their babies. Why teach Pre-K 4 grade students about Lent? It is fundamental in the faith building principles at Ascension Episcopal School that students learn the meaning behind the religious practices that are integral to the Christian values that we teach as part of our school curriculum. The participation in Lent is used as an opportunity to incorporate self-awareness, and conscious thought as part of the students’ daily activities. How excited were students to participate in Lent? The students are very excited to participate in the daily Lent activities. The level of excitement is palpable in anticipation of participating in each part of the ritual. The students bubble over with joy just to count down the days by coloring in their squares on the Walking the calendar each day. They enjoy coloring their own love knots. And of course, they thoroughly enjoy having an opportunity to pray pretzel style, and to have a pretzel snack afterward. Lent, is a time for the students to pray, and read. Each day the students are given a page to read and meditate over during the circle time discussion. The students discuss the concept of temptation and how to resist the impulse to act upon it. In addition, the students are encouraged to be mindful of one another by utilizing active listening skills, giving to one another and doing something kind for others. 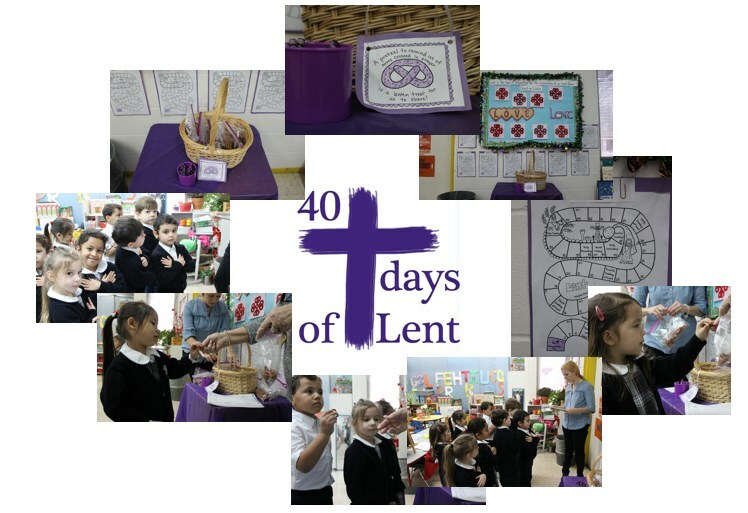 The participation in Lent, provides the students with a tangible and practical application in mindful behavior and self-awareness skills needed to prepare them for Kindergarten. Moreover, the students develop an appreciation for prayer and devotional reading as part of their Christian values. Parents are encouraged to participate with the take-home song for 40 days of Lent and encouraged to share in personal prayer and devotion with their children, while they deepen their understanding in their Christian values. Our AES Kindergarteners have been busy this fall exploring Cause and Effect; "If this happens, then that happens" as it relates to the concept of circle stories and expounding upon their oral language and situational awareness. To tie into the concepts, our students learned the stories, “If You Give a Mouse a Cookie”, and “If You Give a Pig a Pancake”, by Laura Numeroff. Her books delve into exciting adventures that bring the character full circle to the beginning of the story. 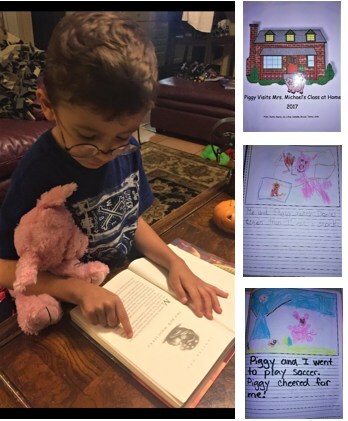 And to extend the lesson into an interactive experience, the students took turns bringing Piggy (our class room stuffed animal) home to share some adventures to draw and write about! To further explore this concept, we have engaged our very own Mrs. Kimberly Michael, AES Kindergarten Teacher to expound on the cause and effect concept. Why teach cause and effect to students of Kindergarten age? You might not even realize it, but cause and effect are taught from the youngest age. In kindergarten, we start to give words and explanations to our actions. Children begin to understand that the “cause” makes the “effect” happen. Example: If I cry when I’m hungry, mommy will feed me. If I touch the stove, I will burn my hand. If I put water in the freezer, it will turn to ice. How do the principles of this concept carry over in the students’ day to day interaction? They learn that cause and effect is even involved in their own behavior and relationships. Our actions affect other people. Example: If I hit Bobby every day, then Bobby won’t want to play with me anymore. If I tell lies, then people won’t believe me even when I’m telling the truth. If I don’t bring my library book back on time, then my class will not earn a certificate. Absolutely! Cause and effect inform decisions on planning and preparation. Anticipation of a cause and effect helps us to avoid bad decisions and act wisely. Both are very important life skills. Kindergarten example: In the morning, I’d better sharpen my pencils so I’m ready when it’s time to write. Elementary grade example: In the afternoon, I’d better check my planner and see which books I need to take home for homework. (When I don’t have the proper materials, then I can’t do good work.) Adult example: If I take my children to school late every day, then they will miss valuable instruction time and be disorganized and unsettled all day long.